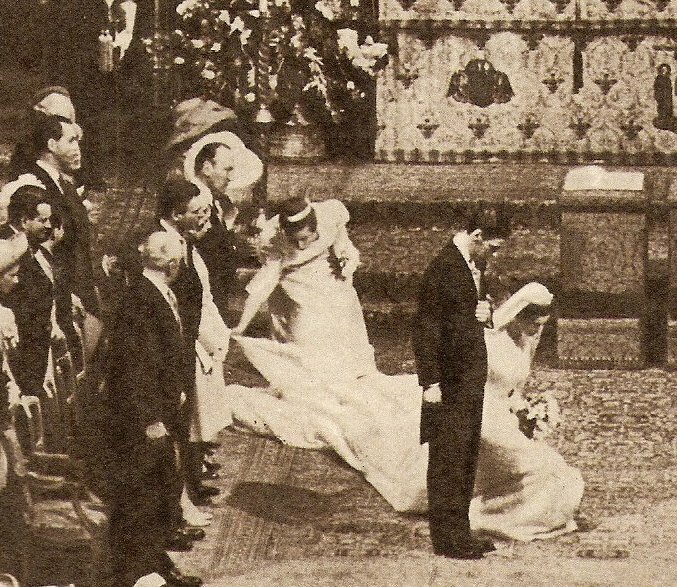 As a granddaughter of King George V and a cousin of the Queen, Princess Alexandra's wedding included plenty of ceremony but wasn't a state occasion (there were no public holidays or balcony appearances). 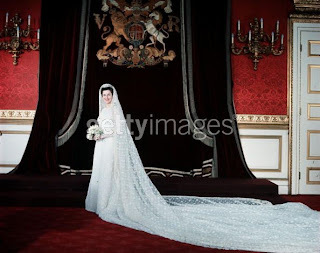 Following pre-wedding festivities including a white tie ball for 2000 at Windsor Castle, the bride left her Kensington Palace home for the Abbey on her wedding day in a Rolls Royce. The newlyweds departed the church for their wedding breakfast at St. James' Palace in a horse-drawn carriage. 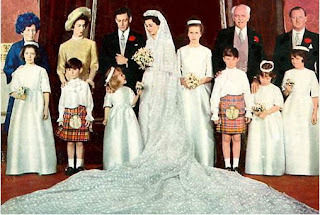 To design her wedding gown, the bride selected John Cavanagh. 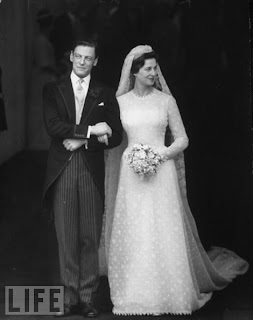 Cavanagh had a long history with the Kents: he dressed Alexandra's mother, Princess Marina; he created the wedding gown of Alexandra's sister-in-law, Katharine, the current Duchess of Kent; he'd even been an employee of Marina's own wedding dress designer. 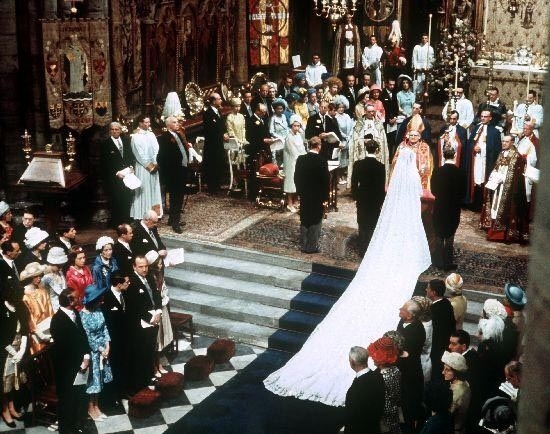 Per the bride's specifications, the gown was to be plain and simple, sans frills. It's an interesting request when you consider the outcome: the silhouette may be simple, but the dress is anything but plain. Most of the fussy characteristics of the dress stem from another bridal request: Alexandra wanted lace. 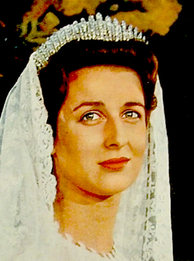 She gave Cavanagh a piece of Valciennes lace from her late grandmother, Princess Nicholas of Greece, and Lady Patricia Ramsey's wedding veil. 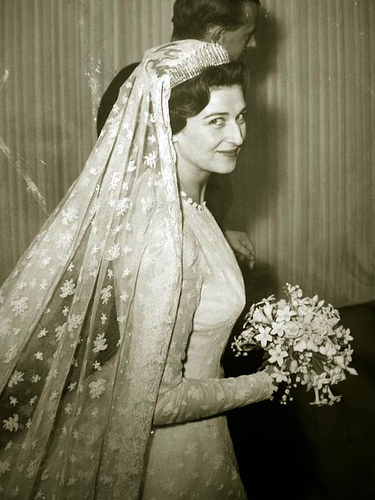 Alexandra requested the lace pattern of the 44-year-old veil be copied for her own gown. This request turned out to be a complicated one: the intricate pattern of oak leaves and acorns couldn't be replicated in Britain. 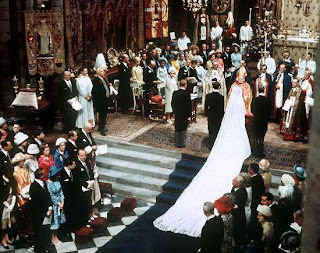 It had to be done in France, which required a crafty arrangement with British customs so that the lace's arrival in Britain wouldn't be tipped off to the press (then, as now, a non-British gown wouldn't go over well). The custom lace was layered over white tulle, with the top and sleeves left transparent. More lace was added to edge the neckline and cuffs, and thousands of gold paillettes were embroidered underneath so that the dress would shimmer as the bride moved. 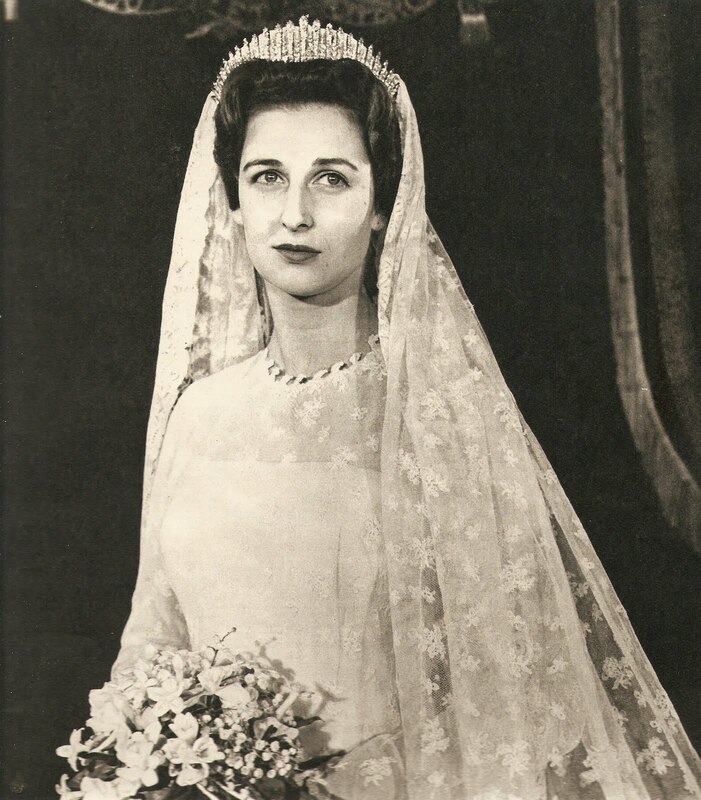 Alexandra walked down the aisle with a veil made of the same lace as her dress, which is quite unusual, and was in fact not in the original dress design. The intent was for the gown to have a court train made of the same lace extending from the bride's shoulders. The veil was to be plain white tulle edged in lace. During a fitting, the designer came up with a new idea: to use the court train as the veil. 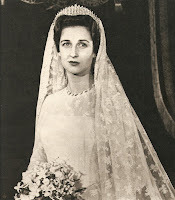 Princess Alexandra agreed, and the train was edged in the Valciennes lace to complete it's veil conversion. She anchored the whole affair with the City of London diamond fringe tiara, the same tiara her mother had worn for her wedding. In my opinion, there are successful elements in this gown, but there are also lessons on what not to do. On the successful side, the slim skirt of the dress and the way it cascades back to a wider train is very flattering to the bride's figure. Adding paillettes for a shimmering effect is a novel idea, and the fringe of the tiara is a wonderful contrast to the patterned lace. On the other side of the coin, this is a very heavy dress. It's heavy visually, with so much lace, and it's literally heavy. You can watch video of the wedding at this link. Watch the bride move. She's moving so slow because she's elegant and stately, but one can also imagine it's because she has to be careful about stopping and starting with so much weight behind her. This reminds me of two Greek brides: Marie-Chantal Miller, and Tatiana Blatnik. Like M-C, we have a high lace neck competing with a lace veil for attention, though I find Alexandra's version more successful since her lace is all the same. And like Tatiana, there are many layers of lace in the train and veil, and the cumulative effect requires a lot of arranging and doesn't always look neat while moving. We also must call to attention the length of that train: at around 21 feet, it's a bit long for Westminster Abbey. That's not that much shorter than Diana, Princess of Wales's train, and Diana had lots more space to play with in St. Paul's Cathedral. Such a long train can also be hazardous to the bridal elegance: if you continue watching the wedding video, you'll see the train get a little caught up after the registry signing. 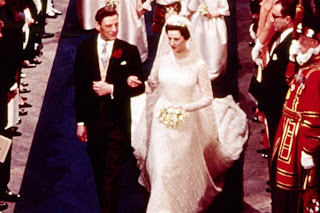 You'll also see chief bridesmaid Princess Anne appear to just tell the bride to keep moving to fix it. (How helpful!) She was clearly no match for the gown. Alexandra's dress is now displayed at Kensington Palace, and you can see it up close and personal in this video. How does this dress rank for you: are you a fan of the lace overload, or not?